Pork chops and apples complement each other nicely, and this crock pot version adds raisins and a tangy brown sugar sauce to the mixture. Also, it's a very easy recipe with only 6 ingredients plus salt. 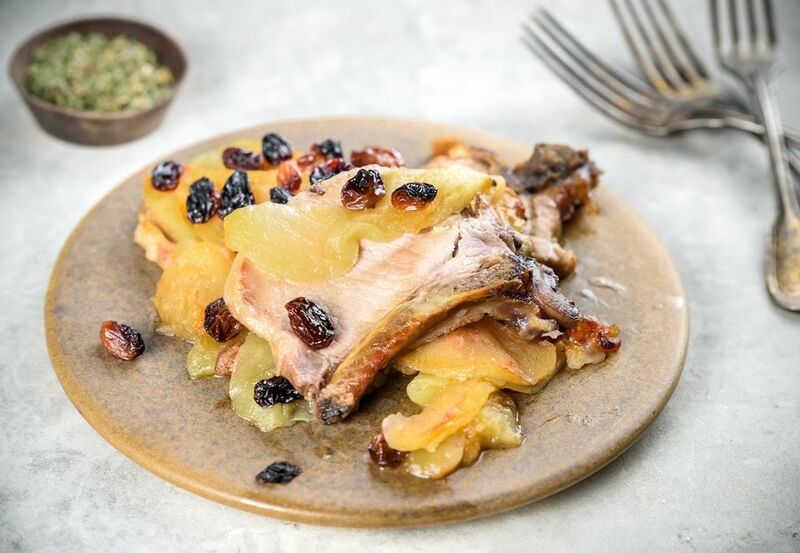 Apples and raisins bring out the flavor of the pork chops in this slow cooker recipe but feel free to replace the raisins with dried cranberries. Enjoy this pork dish with potatoes or rice for an excellent family dinner. Trim the pork chops and discard any excess fat. Heat the oil in a large skillet over medium-high heat. Add the pork chops to the skillet and sear, turning to brown both sides. Sprinkle the pork chops with salt and place them in the slow cooker. Combine remaining ingredients and pour over the pork chops. Cover and cook on low for 6 to 8 hours, or on high for about 3 to 4 hours. Liquids can become watery over the long cooking time in a slow cooker. To reduce the liquids to use as a sauce, strain them into a saucepan. Bring the liquids to a boil over medium-high heat. Reduce the heat to medium-low and continue cooking until the liquids are reduced and the flavors are concentrated. Replace the currants or raisins with dried cranberries.